Les fautes, les erreurs, les ratures et autres éléments de ce type que les manuscrits contiennent, mettent parfois en lumière les acteurs des opérations menées pour produire ces manuscrits. Comment reconnaître une faute, une erreur, et semblables phénomènes ? Que pouvons-nous apprendre des caractéristiques de ces objets ? Peut-on proposer une typologie de ces accidents et les informations que les manuscrits fournissent ainsi ? Telles sont les questions que ces journées proposent d’aborder. En 2014, le projet ERC SAW a organisé un premier colloque à Hambourg avec le Center for the Study of Manuscript cultures (CSMC) de l’Université de Hambourg pour étudier comment les manuscrits de science pouvaient offrir des perspectives irremplaçables pour l’étude des cultures manuscrites (http://sawerc.hypotheses.org/1437). Errors in mathematical procedure texts from the Old Babylonian period : the work of a poorly educated scribe ? Astronomical tables as handwritten objects : errors, corrections and annotation in the Corpus Christi College Ms 283 fol 114- 145. Errors and corrections found in manuscripts depend on the type of texts transmitted. Astronomical tables generate specific sets of mistakes, adjustments and marginal notes because of their peculiar layout, their long lists of numbers, and the intricate layers of mathematical, calendrical and astronomical information they convey. This case study explores how these features of astronomical tables as handwritten objects are attested in the Oxford Corpus Christi College Ms 283. The folios 114 to 145 of this composite manuscript, assembled by William of Clare in the 13th century, were copied at the end of the 12th century. They contains a version of al-Khwarizmi’s tables as translated by Adelard of Bath. These tables were generously annotated in the 13th century possibly by William of Clare. The various adjustments proposed by the medieval actors on this document attest the scope and depth of their writing practices with astronomical tables. More precisely, the analysis of the Sun’s equation tables will help us capture the work of the copyist/compiler of the tables while the reception of this work in a 13th century astronomical context will be addressed through the notes and corrections displayed around the Sun’s and Jupiter’s mean motion tables. Relocating Ethiopic manuscripts in time : mistakes affecting dates in the colophons. Dates transmitted in the colophons of Ethiopic manuscripts often pose some difficulties of interpretation and, consequently, they affect the correct positioning of a text and/or of its support in time. These difficulties can be due to mistakes originating from : (1) palaeographical reasons, because of the similarities between some Ethiopic numbers which are often confused and exchanged ; (2) complex and multiple systems in the computus of the Ethiopian calendar, which makes the calculation of the dates a source of uncertainty for the philologists and a source of errors for the scribes as well ; (3) mistakes made by the copyists who do not verify the accuracy of the dates during the process of copy and rather tend to (mis)interpret or to mechanically reproduce what is transmitted in the model, even if uncorrect. The aim of the paper is to present some case studies to show how complex the process of locating Ethiopic manuscripts and texts in time can be, and which is the role in this played by scribal errors and palaeographic features. Mercury, silver, or just the Moon ? On some misinterpretations and errors in Byzantine alchemical manuscripts. Greek-Byzantine alchemical manuscripts preserve various typologies of texts including among others treatises and recipes. Typical of this literary-scientific production is a large use of symbols standing for elements such as substances, metals and other ingredients used in the different procedures described. The correct de-codification of such system of signs was crucial for every user of Byzantine alchemical manuscripts : lists explaining their meaning were also compiled as aid for the readers. Nevertheless, given the high level of ‘encryption’ of this hidden knowledge, errors are quite common : symbols were both falsely understood and changed with different ones. The analysis of mistakes occurring in different manuscripts can therefore help in understanding the cultural milieu of their producers and users. Starting point of the present investigation will be an alchemical lexicon transmitted in some Byzantine manuscript dating from the 10th to the 15th century. The text has no parallel within the Greek alchemical tradition and it posed many problems to the copyists and users of it, also because of the use of symbolic notation that caused further errors and misunderstandings. Modern editors are also not immune. Do numbers matter ? Mistakes occurring in commentaries for working examples in a Sanskrit astronomical treatise. The south Indian astronomer Paramesvara (c.1360-1460) composed two individual treatises under the same title Goladīpikā, both dealing with various topics related to celestial spheres and circles and giving working examples. One version has an auto-commentary where the explanation on its working example uses symbolic words (bhūtasaṃkhyā) for representing numbers, while the other version, whose commentary by an unknown author is fragmentarily available, only uses digits for the procedures of its examples. The commentary with numerals has many more errors, ranging from simple mis-copies to wrong replacements of numbers. At first glance, it seems obvious that writing with numerals was not a good choice compared to symbolic words. However, the fact that the commentaries show traces of being read while such mistakes were seldom corrected suggests that the correctness of the numbers themselves might not have been important for the reader. Therefore I shall examine how the commentary is structured, both verbally and visually, and look into how numerals could have played a role, even with mistakes. Algebraic treatises often include long collections of problems, that tend to be repetitive from the point of view of the lexicon and of the contents. Although the reader would be tempted to skim them, these collections are the ideal field for finding mistakes. These can be mistakes of calculation due to the author, copyist misunderstanding of the text or, sometimes, false mistakes, i.e. variances that seem to be errors but that are, in fact, corrections made by the author on his reference sources. We will present examples of these three categories of mistakes taken from a 13th century Arabic treatise on algebra and its reference texts. Contradicting classical stemmatology ? The probably oldest copy of the Kitab al-Zina and its many mistakes. The Leipzig University Library holds a fragmentary codex which contains the probably oldest (c. early 11th cent.) witness of text from the Kitab al-Zina, an etymological encyclopaedia written by the Ismaili Abu Hatim al-Razi (died c. 933). The original scribe has been corrected over time by at least three different hands. Aside from superficial mistakes like a different word order or unclear writing, surprisingly often the original text seems to have been plainly wrong and nonsensical. In contrast, a 19th century copy provides us with a far better text, thus contradicting the assumption of classical stemmatology that mistakes increased over time. Several examples of scribal (or other ?) mistakes from the Leipzig manuscript will be presented and interpreted, along with their corrections which are sometimes no less puzzling. When mistakes start making sense : ‘scribal errors’ in Laozi A from Mawangdui 3. What is a mistake, what a scribal error, what an intentional ‘misspelling’ ? Two Laozi manuscripts from the second century BCE unearthed from the tomb Mawangdui 3 have been used as witnesses for a formerly unknown ‘recension’ of the Laozi text and used in textual criticism. After a preliminary classification of ‘misspellings’, some of them will be examined more closely in order to show that they may be have been produced intentionally. Among the sources that document ancient mathematics during the Old Babylonian period, the five mathematical texts composing the “kibsu” group are truly remarkable for several reasons. All the texts share a feature otherwise very uncommon in this field : the presence of a colophon indicating the number of procedures composing the text by means of the Akkadian word kibsu. The group includes two of the first texts ever published dealing with mathematical procedures, those from which the first sketches of glossaries of Akkadian and Sumerian mathematical terms were painfully forged. Another rather uncommon feature is that most of the procedures deal with volume calculation. But what is really interesting for us here is that they sometimes carry out this task with errors. Historians detected an unusually high number of errors in these texts, leading some of them to the suggestion that one or several poorly educated scribes interfered in the history of the transmission of these texts. This historiography raises the question of how to characterize an error or a mistake. Moreover, these texts were usually studied individually, and the group of five texts was never systematically investigated. A global approach to the whole group is proposed here, in order to identify different types of errors, with different meanings. We will examine what errors can tell to present-day historians of science confronted to these kinds of manuscripts : what can be deduced about the author(s) of the documents, about the way the documents were produced, and about the related mathematical practices ? Errors, Mistakes, and Evidence for a Counting Device. A discrepancy in a figure encountered in a text is a deviation between what is expected and what is stated. When it is observed in an economic text, it yields clues about a practice that produced the figure. Here we ask, can discrepancies in texts provide evidence that a counting device was used in the production of some economic texts ? In pursuit of this question, a distinction is offered between errors in which the actor is aware of the discrepancy or potential for a discrepancy, and mistakes in which the actor is not aware of the discrepancy. Discussion will be limited to texts dating to the early Old Babylonian Period (roughly the first quarter of the second millennium BCE) from within the Kingdom of Larsa (southern Mesopotamia). The ultimate goal of this presentation is to explore how discrepancies, that is, errors and mistakes, can be used to illuminate practices employed by an actor to produce a text. Divinare oportet, non legere. 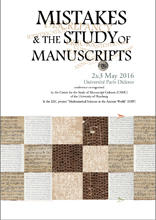 Identification and Interpretation of Errors in Arabic Manuscripts on Natural Sciences. For many centuries Arabic has been an important lingua franca of science. The nature of the language itself —together with its script, defective and redundant at the same time— deeply influenced the written transmission of knowledge. A gallery of examples from a number of textual traditions will present different typologies of error, along with the reconstruction of the process that brought them about. The attitude of the copyists, with their different degrees of attention and awareness, is a fundamental component in the genesis of the error. Only with a deep understanding of this complex and articulated process the philologist can read through the text, in order to reconstruct its tradition and the intellectual history behind it. Mistakes and the edition of mathematical letters of early modern period. Correspondences play a key role in the circulation of early modern mathematics. For the historian, the material of mathematical letters consists of autograph letters, manuscript copies, minutes and printed texts. The study and the comparison of these various sources often reveal mistakes, errors and erasures of different types that may result from the elaboration of the mathematical content, for instance in autograph letters, but also from the copy or the edition process in manuscript copies, minutes and printed texts. Moreover, it is often an issue at stake to determine which kind of errors one is confronted with, especially when only a printed edition is available. In my talk, I will present some examples of such mistakes in mathematical letters mainly excerpted from Descartes’ correspondence. In this case, for several letters, the material at hand only consists of the printed edition of Descartes’ letters by Clerselier. Errors and corrections in some manuscripts of Aristotle and Galen. Errors and corrections or attempted corrections in manuscripts are important tools for the reconstruction of the work of scribes and scholars and for determining the role a manuscript played in the transmission. Errors which are due to a misreading or misinterpreting of the palaeographical form of a certain manuscript constitute the clearest evidence to demonstrate that two or more manuscripts belong to a circle of production and rewriting. The tendency of scribes to commit errors or a noticeable ability to detect or even correct them provides us with important data to investigate the intellectual settings in which the manuscripts were used, annotated and revised. Sometimes creative errors in the manuscript tradition could have been the origin of variant readings which inspire scholarly discussions until the present day. Focussing on manuscripts of Aristotle and Galen this paper will discuss examples of such errors and corrections. Bus 325 / Stop : Watt.